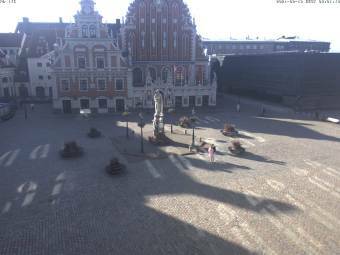 It's 22:29 in Riga, Latvia right now. House of the Blackheads Webcam showing the 'House of the Blackheads' in the center of Riga. Riga: Suspension Bridge over Daugava River, 0 miles away. Riga: HD Panorama over Riga, 0 miles away. Riga: Riga Central Market, 0 miles away. Riga: Riga Panorama, 0 miles away. Riga: 11 November Embankment, 0 miles away. Riga: The Freedom Monument Square, 0 miles away. Riga: St.John’s Church (Skarnu Street), 0 miles away. Riga: Līvu Square, 0 miles away.